Taipei, Aug. 23 (CNA) The Ministry of Foreign Affairs said Thursday that it hopes the tension in the East China Sea will not continue to grow as a result of nationalism amid the dispute over the Diaoyutai Islands. "We don't want to see the tension continue to grow in the region as a result of the development of populist or nationalist emotions," ministry spokesman Steve Hsia said when asked to comment on a proposal by the minor opposition New Party that the government should turn the Diaoyutais into a military base for carrying out live-fire training drills. Hsia's remarks came amid heightened tension in the East China Sea over conflicting territorial claims to the Diaoyutais by Taiwan, Japan and China. "We also hope all parties can stick to rational and peaceful means to address related disputes," he said, while reaffirming Taiwan's sovereignty over the island chain. The latest flare-up over the islands came after a group of Hong Kong activists landed on the islands and raised People's Republic of China and Republic of China flags Aug. 15. Four days later, Japanese lawmakers led a group of Japanese activists to the Diaoyutais, some of whom landed on the island, prompting Taiwan's Foreign Ministry to lodge a serious protest to Japan. The incident also triggered anti-Japanese protests across China. Lying about 100 nautical miles off Taiwan's northeastern tip, the Diaoyutais are known as the Diaoyutai Islands in China and as the Senkaku Islands in Japan, which currently controls them. Hsia urged all sides to shelve the dispute and jointly explore and develop the resources in the region. Citing an East China Sea peace initiative proposed by President Ma Ying-jeou earlier this month, he called on all sides to refrain from taking hostile action. 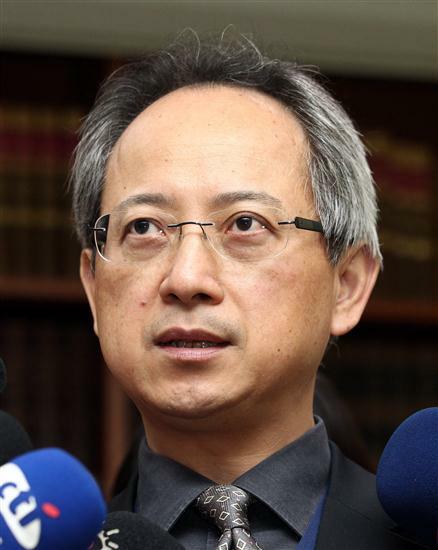 Hsia also reiterated that Taiwan will not join hands with China against Japan on the Diaoyutais issue.